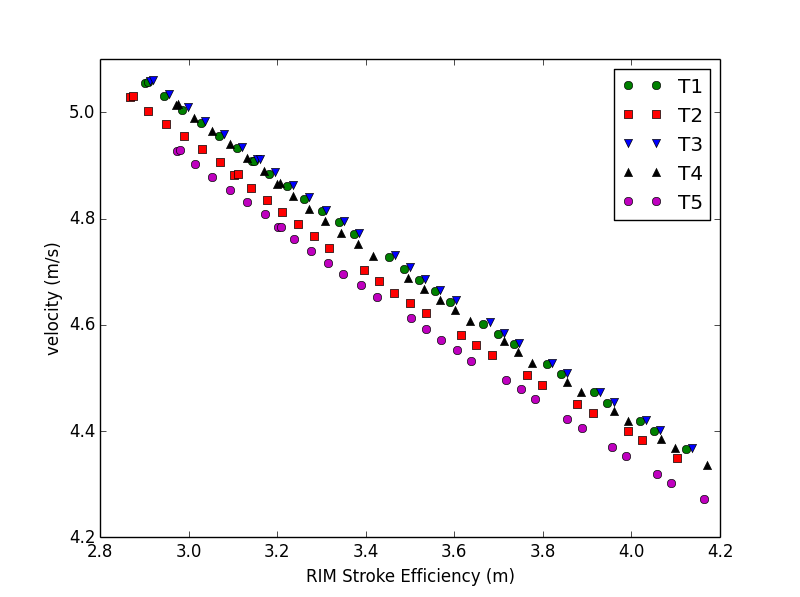 For OTW stroke metrics, there are two interesting applications, RIM (http://www.rowinginmotion.com/) and Crewnerd (http://performancephones.com/crewnerd/). Crewnerd gives a “check factor” metric of how well you are rowing. RIM has several metrics. Today I will discuss “stroke efficiency” and “check factor”. I was interested to see what my model had to say about these metrics. Be aware that this post may tell as much about the imperfections of my model as about those two apps. The ultimate efficiency measure of rowing is to get the maximum average boat speed at a given power. The below picture is a key picture calculates just that. 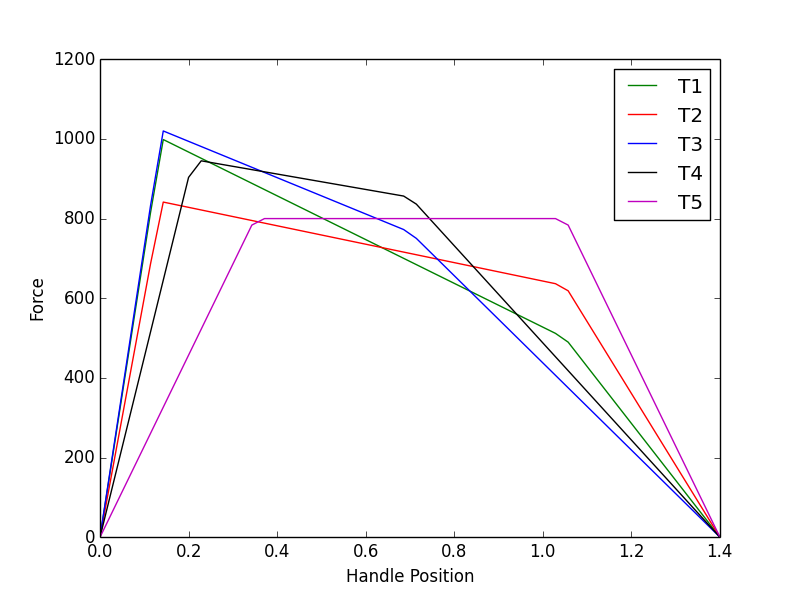 The differences between the different stroke profiles are quite subtle. So what does the graph tell us? First, that the differences in speed are very subtle. Still, it seems that red circles (T2) are the most efficient, lowest average power at a given average boat speed. Profile T5 seems to be the worst. So how does Crewnerd’s “Check Factor” look like? T5 is clearly the worst, giving the highest value of “check” at a given boat speed. What is also clear is that to increase speed, one ends up inevitably with a higher value of “check”. Don’t try to minimize check at the cost of losing speed! Now we turn to RIM. The RIM definition of “check” is just the difference between max and min boat speed. 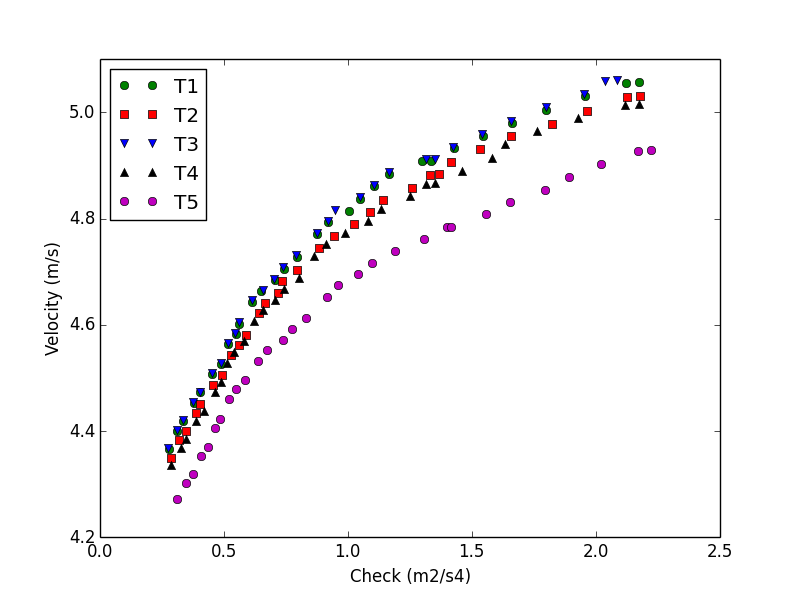 So, at a given velocity, T2 is clearly the “lowest check” value and T5 the worst. 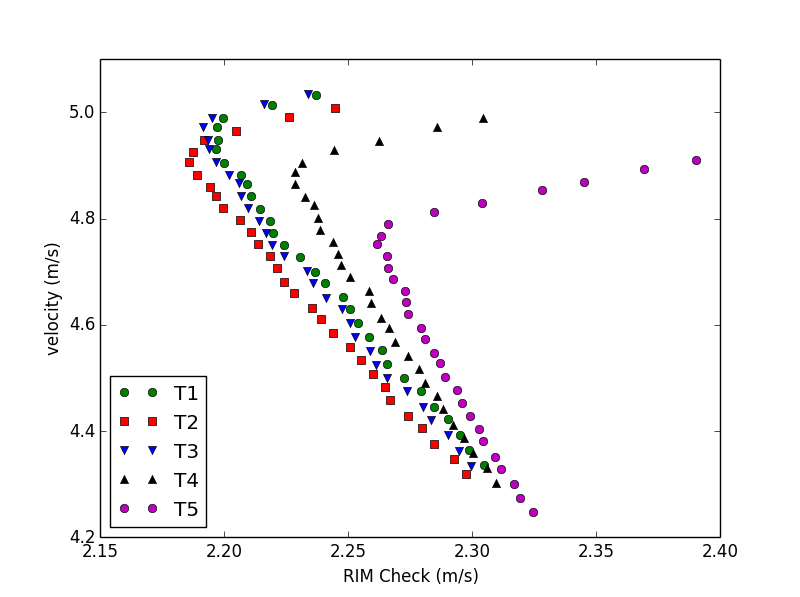 It seems also RIM definition of “check” is useful. RIM has another metric, “stroke efficiency”, defined as the integral of boat speed over one stroke, minus the integral of minimum boat speed. It measures how much further your stroke takes you compared to the minimum boat speed. For this metric, higher is better. So again T5 scores the worst, and the best seems to be T3. At given boat speed and stroke rate, the three tested metrics are consistent in the sense that optimizing them brings you to the most efficient power profile. This entry was posted in Uncategorized on April 6, 2015 by sanderroosendaal. Looking at some older post on my own blog, it seems that getting the catch angle right is more significant than the force profile.